That color coordination, I’m jealous. Wonder Woman 1984 is shaping up to be a righteous flick, with Gal Gadot and Chris Pine putting on their best fanny packs and shoulder pads to save the world from champagne fountains and cocaine parties...or something like that. We may not yet know what role Pedro Pascal is playing in Patty Jenkins’ sequel, but we’ve got our first look at his character thanks to the director. And uh oh, I think we know who ordered the champagne fountain, folks. Jenkins shared the first look at Pascal’s character on Twitter, not necessarily giving any clues as to who he’s playing or what part he’s serving in the film. She simply tweeted, “Can’t…Stop…Watching…” Hmm. The image appears to be of a TV screen, similar to the ones Gadot’s Diana was watching in a previously released still. 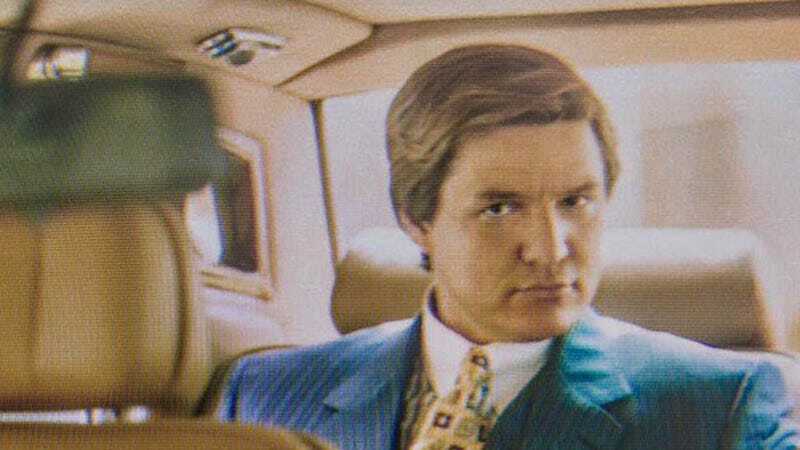 The full image Jenkins shared on Twitter of Pedro Pascal. A lot of speculation has been bubbling about the character—that he could be another villain, working alongside Kristin Wiig’s Cheetah, or that he’s Diana’s father Zeus, having taken his place among humans like Ares did in the first film. Could Jenkins’ “can’t stop watching” mean the character’s powers convince viewers to stay tuned in? No matter what his actual purpose, can we all agree he’s basically Dallas without the cowboy hat? And man, Leonardo DiCaprio’s The Wolf of Wall Street bro has nothing on this guy. In addition to Gadot, Pine, Pascal, and Wiig, Wonder Woman 1984 also stars Natasha Rothwell, Ravi Patel, and Gabriella Wilde, all in undisclosed roles. The film, written and directed by Jenkins, is scheduled for release November 1, 2019.